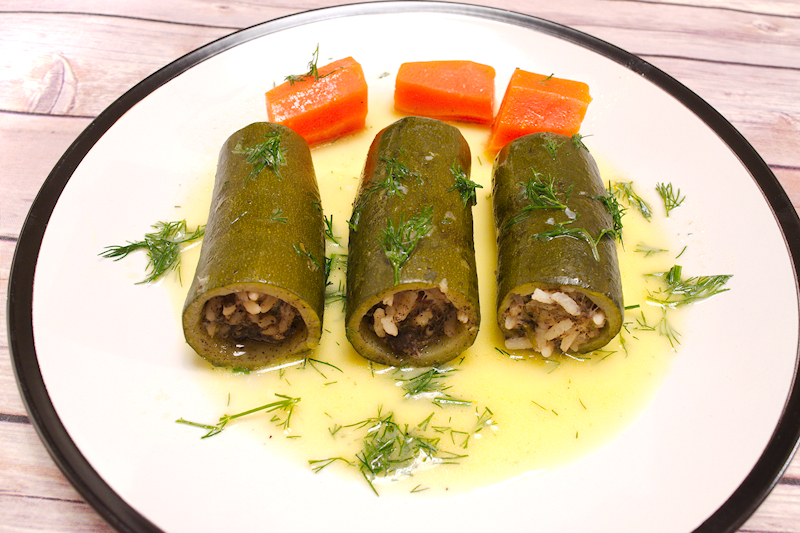 This is an easy recipe for zucchini stuffed with beef and rice in an egg and lemon sauce. A hearty and delicious Greek stew with Avgolemono. There are some dishes that don’t get the attention they deserve. Maybe they are considered bland or not really interesting to be included in a restaurant menu. However, when they are done well and with love, they are heaven! 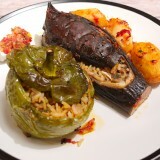 Stuffed zucchini are one of these dishes, in my opinion. When you are hungry and you go to a Greek restaurant you don’t just fancy stuffed zucchini, do you? 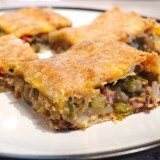 However, if you try one of the traditional recipes that our mother and grandmothers used I am sure you will change your opinion. This stuffed zucchini stew is a perfect example where the gorgeous egg and lemon sauce (Avgolemono) takes the dish to another level. I don’t think that this kind of sauce is popular anywhere else. But maybe I am wrong. It sound strange at the beginning (Egg and lemon? Seriously?) but when you try it you never go back to bland gravy-type of sauces. 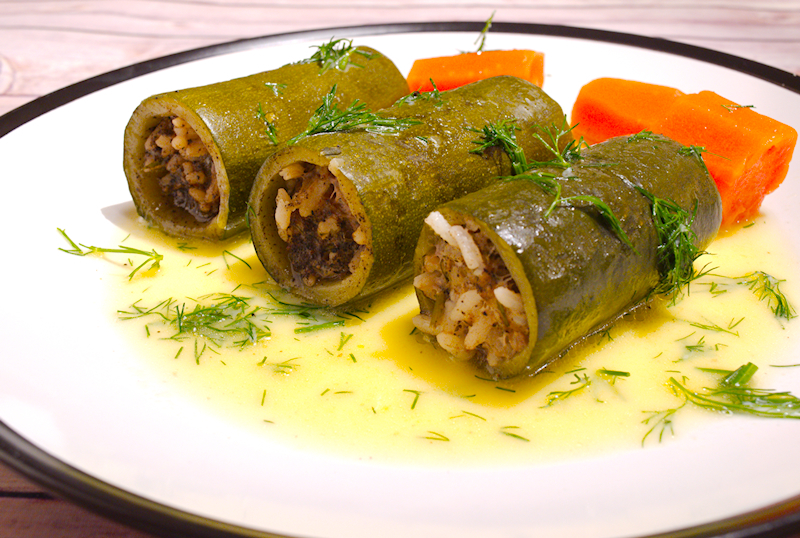 Of course, as a respectful Greek stew, stuffed zucchini need their herbs. Parsley and dill of course, with dill being one of my favorite herbs together with fennel. Just leave some on the side to add it to the Avgolemono sauce at the end. It looks a bit time consuming but it’s not really. The only difficult part is the removal of the flesh of the zucchini. 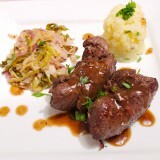 After that, you slow cook it for about 1 ½ hours and it’s done. The sauce can be ready in 2 minutes. 250 gr (9 oz) mince beef. 100 gr (3.5 oz) long grain rice. A small bunch of flat-lead parsley. Add the onion, parsley and dill in a food processor and chop them for a few seconds. Add them in a bowl together with the meat and rice. Add 2 tablespoons of olive oil, season with salt and pepper and knead for a few minutes. 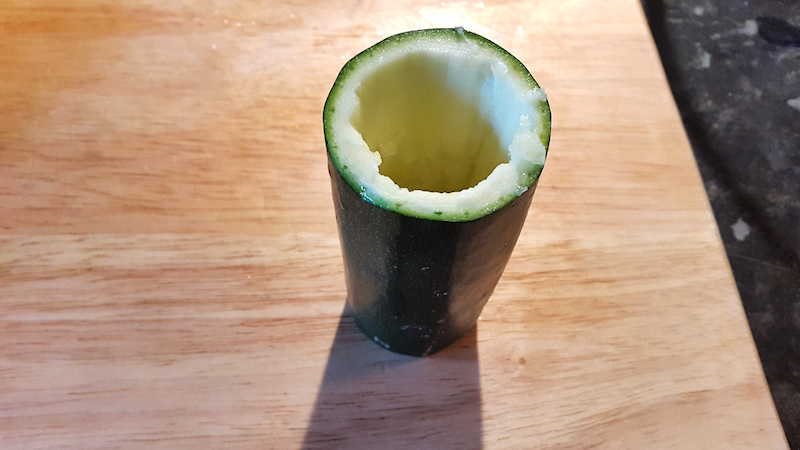 Cut the zucchini in half. Cut the edges so they are relatively flat so they can stand still in the pot. Use a knife and start removing the flesh from the zucchini. Make sure you don't tear the walls as you don't want them to leak during cooking. Also, try not to reach the bottom and leave ~ ½ inch of a spacer. 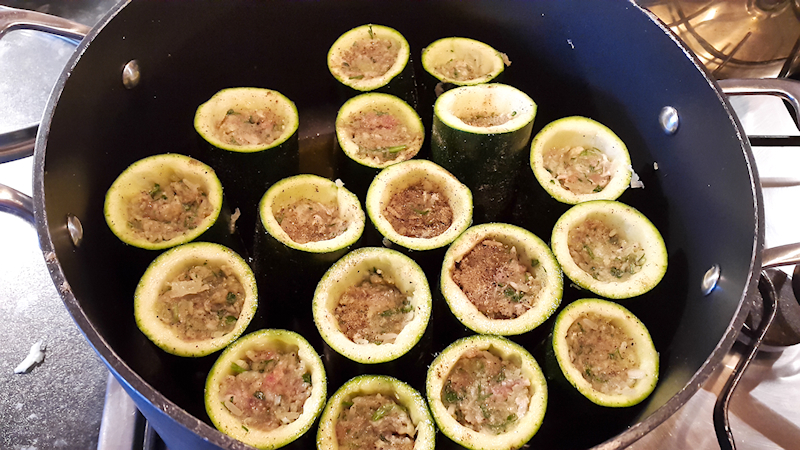 Use a spoon and start filling the zucchini with the meat and rice mixture. Place them one by one in the pot making sure that they are tight and they won't fall during cooking. Cut the carrot in 4-5 pieces and add it into the pot. Pour in the remaining olive oil and fill the pot with warm water until it reaches just below the top of the zucchini (~ 1 inch). Cover with a plate to make sure that the zucchini do not move during cooking. 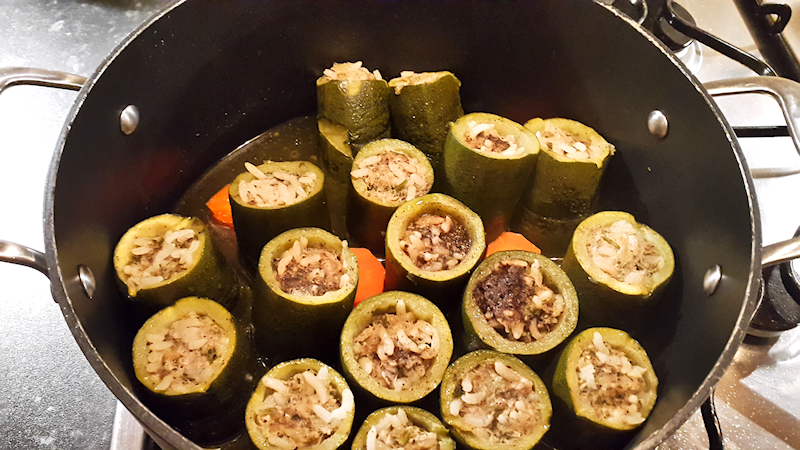 Cook the stuffed zucchini on low heat with the lid on for ~ 1 ½ hours. For the Avgolemono sauce, add the eggs and juice from the lemons in a bowl and start whisking. Use a tablespoon and introduce some of the juice from the zucchini pot. Keep whisking because you don't want the eggs to be cooked from the heat of the juice. Add some more juice (~ 6-7 tablespoons in total) while you keep whisking. Add the corn flour and whisk well. 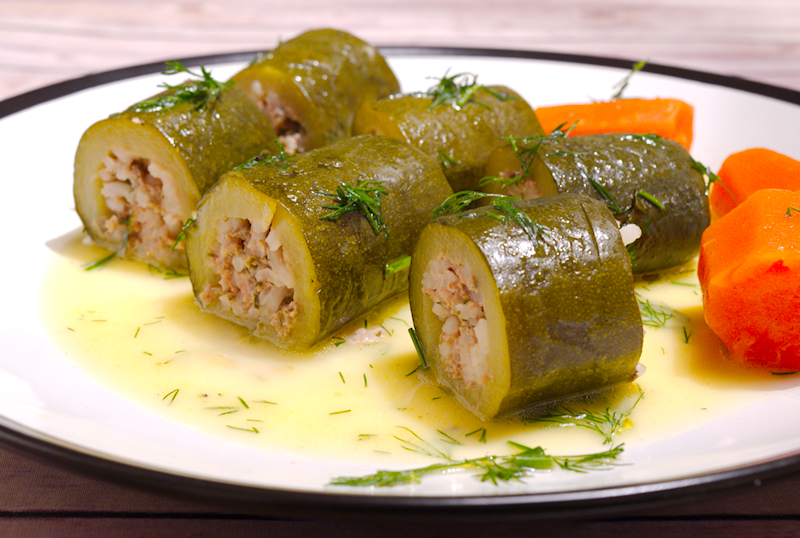 Serve the stuffed zucchini with the egg and lemon sauce on top.